It has been a long time since I've named a game, so let's give it a go! Today's entry is a fabulous Phil Garner card from the ever-loved 1983 Topps set. It is also the first game I've named that featured two players will awesome nicknames: Bad Dude and Scrap Iron. Bad Dude (aka John Stearns) was a "speedster" catcher that played every game of his 11 year career for the New York Mets, save for his debut game with the Philadelphia Phillies. 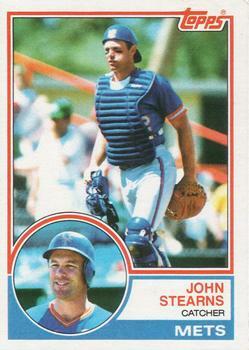 Growing up, Stearns was known to me because from 1978 to 1982 he held the record for most stolen bases by a catcher in a single season (25). This record was obliterated in 1982 by John Wathan who stole 36 bases. So, I find it very appropriate that today's Name the Game card features Stearns stealing a base. 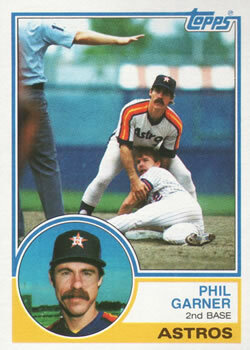 As for the other cool mustachioed cat, that's Scrap Iron (aka Phil Garner). Garner earned his nickname for his style of play, and Stearns earned the Bad Dude handle from his early football days. Looking at Garner's card, we can tell this game is played at Shea Stadium between the visiting Houston Astros and the New York Mets. What I absolutely love about this card is that both Garner and Stearns are looking at the second base ump to find out if Stearns stole a bag or was caught stealing by Alan Ashby's "cannon." Considering Ashby only caught 19% of the base runners stealing in 1982, it's no surprise that Stearns is safe. So, we know the date, May 30, 1982. Review of the box score shows that this play took place in the bottom of the 2nd. Prior to this play, Steans had been hit by a pitch from Mike LaCoss, so I guess Bad Dude was flashing his wheels to rub an extra base into LaCoss' ego. And for you completists out that, the second base ump was Paul Runge! Also, if you want me to Name a Game for a specific card, please leave a comment! Nice detective work. IN studying this card you are showing I noticed the blur on the the left side which at first I thought might be the catchers face-mask (and could probably be mistaken for a mail carrier's bag on the Ump) but upon closer examination looks to a fielder's right gloved hand. So upon some digging of my own it appears to be the lefty first baseman Danny Heep. Whom I also noticed was traded to the Mets at the end of that season.